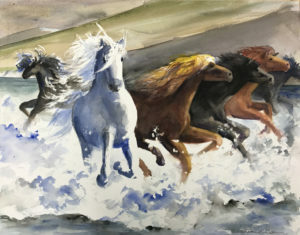 My painting “Icelandic Horses Gallop in the Sea” is on view along with 90+ outstanding works in all media at this biennial show at Peninsula Jewish Community Center. The level of accomplishment represented by the artwork in this show is high indeed, and I am honored to have a piece selected for inclusion. “POP-UP PLEIN AIR”: A new way to workshop! My summer schedule is unpredictable this year, and I have not been able to plan any two- or three-day workshops. However, I thought I might try something new this summer. I do, indeed, intend to go out and paint, and when I know a few days ahead of time where I will be and when, I will send out an announcement, and if you want, you can show up and we’ll do a shorter workshop (3 – 4 hours) with me, just come along, and we’ll do it. As in other workshops, I’ll start a demo, then you can either paint what I am painting, or you can go seek out a scene that appeals to you and have at it!